The world of women’s ice hockey is a small one. That world consists of North America: Canada and the United States. Since women’s hockey has come to the Olympics these two countries have pretty much staged a two-team tournament. In five Olympic games, Canada and the United States have won the gold medal each time. The Americans won the gold in 1998 in Nagano but since then, it’s been Canada four Olympic games in a row. Here we go again. This time it’s PyeongChang. 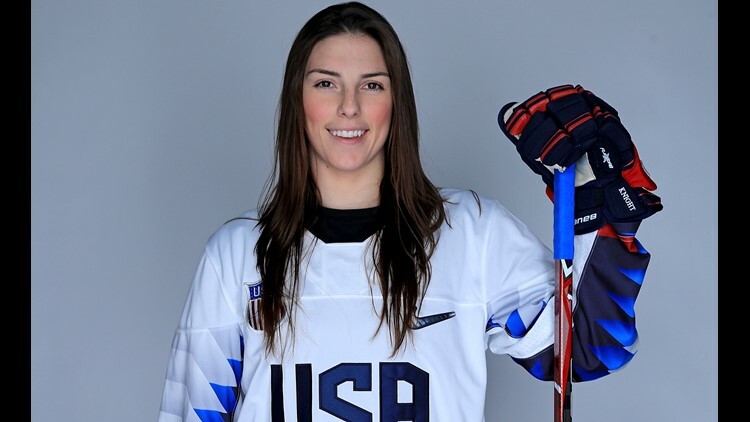 "The rivalry between the U.S. and Canada is one of the most beautiful rivalries in sport," said two-time Olympian Hilary Knight. "The level of competition we bring whether it’s in someone’s barn, an outdoor rink or a world stage it doesn’t matter, it goes to show how much we respect one another in terms of sheer dominant hockey teams. It’s always a great game, the fans get involved and it’s the game we live for." Hilary Knight #21 of the United States Women's Hockey Team poses for a portrait on January 16, 2018 in Wesley Chapel, Florida. "I love being a part of it, there’s nothing like a game against Canada," said Meghan Duggan. "We want to win every time, we want to win in a landslide and it’s do or die when we play against them." It should come down to Canada and the U.S. once again. 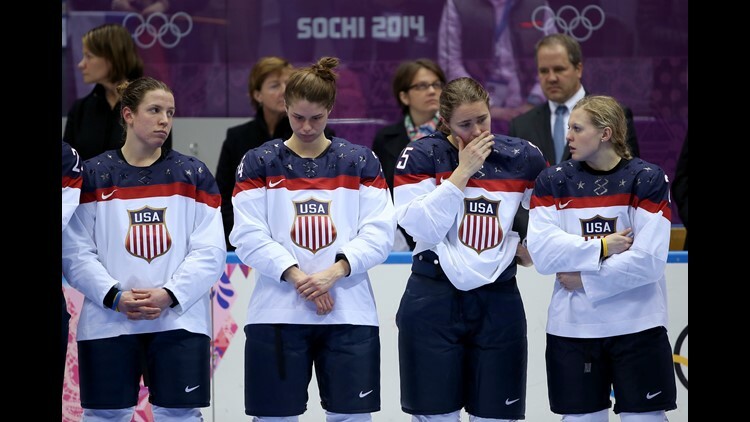 All of the losses have been bitter for the American women, but the last one really stung in Sochi. Team USA had a 2-nothing lead in the 3rd Period….but Canada ripped off two goals in the closing minutes to force overtime. The U.S. was rattled and Team Canada won in Sudden Death 3-to-2. "We came up short and it’s disappointing, it’s not what we’re training for or what we’re going for," said Amanda Kessel. "You have to appreciate you were there and take away a silver medal but in the end it’s really not what we’re playing for." Michelle Picard, Josephine Pucci, Alex Carpenter and Kendall Coyne of the United States react during the flower ceremony after losing to Canada 3-2 during the Ice Hockey Women's Gold Medal Game of the Sochi 2014 Winter Olympics on February 20, 2014. The loss in Sochi lives with them every day. But the possibility of beating Canada to win gold is what keeps them coming back to the rink every day. Mark this date on your calendar: Feb. 22 -- that’s the gold medal game. That’s when this rivalry gets even better. "This team is amazing and I can’t wait for the world to see us in February the chemistry we have off the ice the level of skill and talent we have on the ice is a lethal combination," said Knight. Julie Chu #13 of United States and Brianne Jenner #19 of Canada in action during the Ice Hockey Women's Gold Medal Game on day 13 of the Sochi 2014 Winter Olympics at Bolshoy Ice Dome on February 20, 2014 in Sochi, Russia. Kelli Stack #16 of the United States handles the puck against Laura Fortino #8 of Canada during the Ice Hockey Women's Gold Medal Game on day 13 of the Sochi 2014 Winter Olympics at Bolshoy Ice Dome on February 20, 2014 in Sochi, Russia. Rebecca Johnston #6 of Canada celebrates goal in the third period against United States during the Ice Hockey Women's Gold Medal Game on day 13 of the Sochi 2014 Winter Olympics at Bolshoy Ice Dome on February 20, 2014 in Sochi, Russia. Hayley Wickenheiser #22 of Canada and Kelli Stack #16 of United States battle for possession during the Ice Hockey Women's Gold Medal Game on day 13 of the Sochi 2014 Winter Olympics at Bolshoy Ice Dome on February 20, 2014 in Sochi, Russia. Shannon Szabados #1 of Canada tends goal against the United States during the Ice Hockey Women's Gold Medal Game on day 13 of the Sochi 2014 Winter Olympics at Bolshoy Ice Dome on February 20, 2014 in Sochi, Russia. Hilary Knight #21 of the United States cross-checks Hayley Wickenheiser #22 of Canada during the Ice Hockey Women's Gold Medal Game on day 13 of the Sochi 2014 Winter Olympics at Bolshoy Ice Dome on February 20, 2014 in Sochi, Russia. Canada celebrates after defeating the United States 3-2 during the Ice Hockey Women's Gold Medal Game on day 13 of the Sochi 2014 Winter Olympics at Bolshoy Ice Dome on February 20, 2014 in Sochi, Russia. The United States reacts after losing 3-2 in overtime against Canada during the Ice Hockey Women's Gold Medal Game on day 13 of the Sochi 2014 Winter Olympics at Bolshoy Ice Dome on February 20, 2014 in Sochi, Russia. Silver medalists the United States react during the flower ceremony for the Ice Hockey Women's Gold Medal Game on day 13 of the Sochi 2014 Winter Olympics at Bolshoy Ice Dome on February 20, 2014 in Sochi, Russia. Canada's goalkeeper Shannon Szabados and Canada's Hayley Wickenheiser celebrate after the Women's Ice Hockey Medal Ceremony following the final game Canada vs USA at the Bolshoy Ice Dome plaza during the Sochi Winter Olympics.